Tyson Fury has signed a multi-year, multi-fight promotional deal with ESPN and Bob Arum's Top Rank, reportedly worth as much as £80m (€92m), casting doubt over a rematch with Deontay Wilder in doubt. 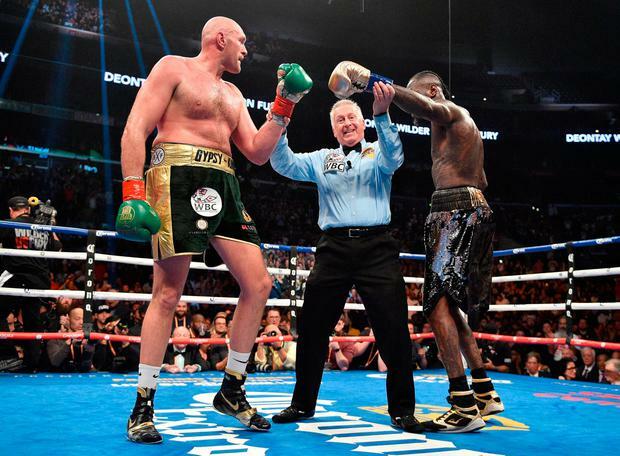 The pair's heavyweight blockbuster in December was aired on rival US broadcaster Showtime - who Wilder has worked with exclusively throughout his career - while Fury will now only appear on ESPN in the US. "I want Wilder, I still want Wilder, but I would also take (Anthony) Joshua and I have more chance of getting them with this deal," Fury insisted. The deal gives Fury far more power in the crucial negotiations, increased say over location, officials and percentages. Fury will fight next in America, the first of three fights this year, and it could, in theory, be Wilder, the WBC heavyweight champion, in the opposite corner. The new deal, however, gives Fury a lot more power and influence at the table when his people sit down with Wilder's people. However, Wilder's people - a glorious term in the boxing trade - only found out about the new deal when Warren made it public yesterday morning. It is a huge collaboration in the boxing industry. Fury will still be promoted by Warren in Britain, screened live in America on ESPN, live on BT in Britain and Ireland, and Arum will work with Warren as the American promoter. Warren and Arum first worked together in 1985 when Welshman Colin Jones fought Donald Curry for the welterweight world title. "The story continues," said Fury. "After the anxiety, the weight I gained, the depression, the drinking and the drugs - it's a Cinderella story and it is not over. I'm nearly seven-foot tall, weighed nearly 30 stone and I came out with the mental health issues. I'm fighting for more than just boxing." Warren resurrected Fury's career last year, watching with care and experience over the loss of nine stone and the struggles to clear the fallen boxer's head. Warren has sat in vigil over troubled fighters before and knew that a slimmer waistline would not necessarily be enough magic to convert the wayward fighter for a long run at the championship. "He has changed his life totally to get where he is today - that is a different man," said Warren. Fury worked in solitude for a year with his new coach Ben Davison and from boxing's wilderness the gentle construction of the toppled giant took place. In many ways the work was completed when Fury rose from the canvas in the final two minutes of the 12th round last December; it was a sensation. The fight was scored a draw, but Fury left the ring a star after that long night in Tinsel Town. He entered a big man, but left the ring an even bigger man and that is the reason for the new deal.